Please welcome Lisa Goldstein to The Qwillery. 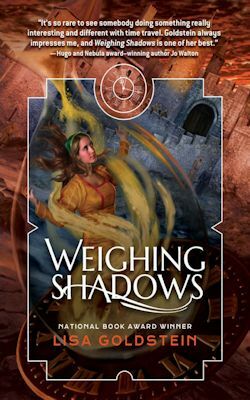 Weighing Shadows was published by Night Shade Books on November 3, 2015. Lisa: For some reason I always knew I wanted to be a writer, and I started writing pretty much as soon as I could read. When I was about five years old I wrote a story about someone waking up and finding snow on the ground outside -- a story I must have stolen from somewhere, since I grew up in Los Angeles. TQ: Are you a plotter, a pantser or a hybrid? What is the most challenging thing for you about writing? Lisa: Mostly a pantser. I wish I could be a plotter, since making things up as I go along means that I will sometimes end up with dangling plot-threads or an extra character or two, and then I have to go back and unravel entire sections of the manuscript. I did make a fairly complete outline for a book once, but I found that outlining took away a lot of the joy of discovery when I came to write it. TQ: Describe Weighing Shadows in 140 characters or less. Lisa: A contemporary woman is recruited into an organization that travels in time, but she becomes suspicious of their motives while visiting the past. TQ: Tell us something about Weighing Shadows that is not found in the book description. Lisa: I recently learned that it’s common in Cuba to give children names starting with “y,” like Yoani or Yasiel. I liked this so much that I gave one of my characters a name like this -- Yaniel -- though I never found a place to mention that he’s of Cuban descent. I guess he’s lucky I didn’t call him Usnavi, which is a Cuban name that comes from people seeing ships in the harbor with “U.S. Navy” on them. 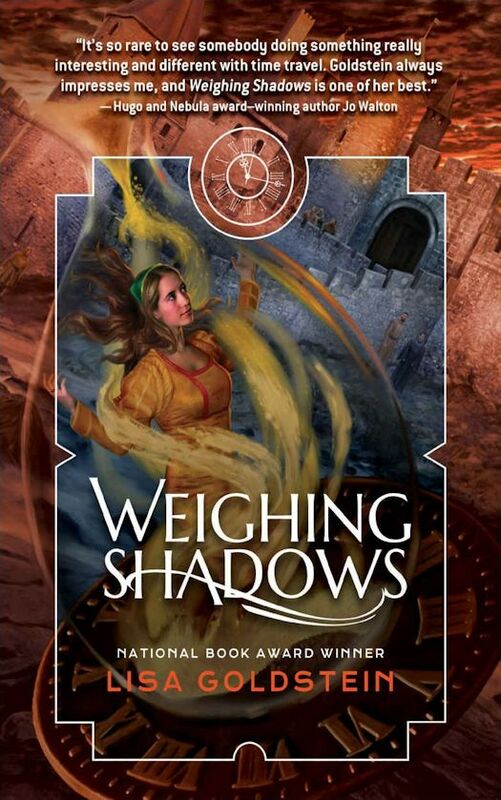 TQ: What inspired you to write Weighing Shadows? What appeals to you about writing Fantasy? Lisa: A lot of things all came together with Weighing Shadows. I’ve always wanted to write a book about time travel, because it looked like it would be a lot of fun. Then I came up with the idea of a group of women, goddess worshippers, who had to go undercover when more patriarchal cultures came to power but who survived down to the present day and were still able to influence things from the shadows. I wanted to learn more about matriarchies, especially ancient Crete, and other little-known eras of history. And finally, I came up with a character I really liked, someone who joined a company of time travelers but who was independent enough to make up her own mind, who could realize that the company might not have her best interests, or the best interests of her time period, in mind. I usually write fantasy, but Weighing Shadows is science fiction. I wanted to see if I could do that science-fiction thing where you take a hypothesis -- in this case that people can travel through time -- and work out some of the permutations. One of the things I came up with was that if people had this ability they would almost certainly use it to get and hold onto power for themselves, no matter what benevolent reasons they had started out with. TQ: What sort of research did you do for Weighing Shadows? Lisa: I read a ton of books to research the three main time periods -- ancient Crete, the destruction of the Library of Alexandria, and thirteenth-century troubadours in southern France. In a lot of ways this was the most fun part of writing. Ancient Crete was the hardest because so little is known about it, and also because even historians can’t seem to get their heads around what it would mean to live in a matriarchal society. For example, a lot of historians called a beautiful chair in the palace at Knossos “the throne of King Minos,” but wouldn’t a matriarchy have a queen, not a king? Serendipitously, when I started to research the troubadours my husband became interested in learning how to play the lute, and I got to hear what a lot of the songs would have sounded like. The hard part was figuring out the people in other eras. They’re so far from our experience, and their mindset would be very different from ours. TQ: Why have you chosen to include or not chosen to include social issues in Weighing Shadows? Lisa: This is a hard one. If I write that a matriarchal society like ancient Crete existed for over a thousand years with almost no wars, that they had a prosperous and vibrant and artistic society, am I making a point about feminism or just writing about a historical epoch? Some people will say it’s the former, but would they even notice if I wrote about a thriving patriarchal culture? If I make women and people of color the main characters in this book, is that a social issue or just a way of including people who have been excluded earlier? Weighing Shadows does reflect things I believe in, just like every novel I ever wrote, just like every novel anyone ever wrote, but my main focus was trying to tell a good story. TQ: Which question about Weighing Shadows do you wish someone would ask? Ask it and answer it! Q: What was the most fun part to write? I really enjoyed visiting various time periods. This is something I’d never get a chance to do in real life, so it was great to do it in my imagination, to describe what it would be like to live in a matriarchy, or a city under siege. And I’d always wanted to save books from the fire at the Library of Alexandria, so I got to do that. TQ: Give us one or two of your favorite non-spoilery quotes from Weighing Shadows. Lisa: I just sold two short stories, “Sawing” to Nightmare and “The Catastrophe of Cities” to Asimov’s Science Fiction, and I’m gearing up to write another novel. Ann Decker fixes computers for a living, and in the evenings she passes the time sharpening her hacking skills. It’s not a very interesting life, but she gets by—until one day she’s contacted with a job offer for a company called Transformations Incorporated. None of her coworkers have ever heard of it before, and when Ann is finally told what the company does, she can hardly believe it: TI has invented technology to travel in time. Soon Ann is visiting a matriarchy in ancient Crete, and then a woman mathematician at the Library of Alexandria. But Transformations Incorporated remains shrouded in mystery, and when Ann finally catches her breath, there are too many troubling questions still unanswered. Who are Transformations Incorporated, and what will they use this technology to gain? What ill effects might going back in time have on the present day? Is it really as harmless as TI says? When a coworker turns up dead, Ann’s superiors warn her about a covert group called Core out to sabotage the company. Something just isn’t right, but before she has time to investigate, Ann is sent to a castle in the south of France, nearly a thousand years in the past. As the armies of the Crusade arrive to lay siege, and intrigue grows among the viscount’s family, Ann will discover the startling truth—not just about the company that sent her there, but also about her own past. Lisa Goldstein is the National Book Award-winning fantasy author of The Red Magician. Her stories have appeared in Ms., Asimov’s Science Fiction, and The Year’s Best Fantasy and Horror, and her novels and short stories have been finalists for the Hugo, Nebula, and World Fantasy awards. Her novel, The Uncertain Places, won the Mythopoeic Award and her short story “Paradise Is a Walled Garden” won the Sidewise Award.